Yesterday was indeed a sad day for the family of Nollywood actor Okaka De Don who joined his ancestors in a ghastly road accident along Lagos-Badagry express road in Ojo. The Actor and movie producer was taking a quick ride with his bossom friend when a speedy trailer from nowhere lost track and rammed into them on Friday along Lagos-Badagry express road in Ojo. 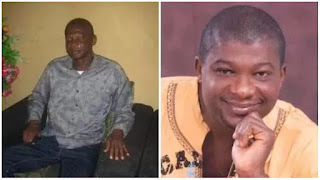 Gideon Ameh, Actors Guild of Nigeria, Benue state chapter has since then came out to confirmed the sad news to be true adding that his corpse has been deposited in a mortuary in Lagos. May his gentle soul rest in perfect peace Amen.